TUESDAY, July 12, 2016 (HealthDay News) -- Electronic stimulation of a nerve running from the brain to the gut may help ease stubborn symptoms of rheumatoid arthritis, preliminary research suggests. The study, of 17 adults with the painful autoimmune disease, tested the effects of vagus nerve stimulation -- a technique long used to control seizures in some people with epilepsy. It found that over six weeks, most of the patients showed some improvements in joint swelling and other symptoms. One rheumatologist called the treatment approach "intriguing." "This isn't pie in the sky. It's a potentially viable alternative to what's available now for RA [rheumatoid arthritis]," said Dr. David Borenstein, a rheumatologist at George Washington University Medical Center, in Washington, D.C.
Vagus nerve stimulation, or VNS, is done using a device that is surgically implanted under the skin of the chest, with a wire that connects it to one of the vagus nerves in the neck. The implant is programmed to periodically send electrical pulses to the nerve. Recent lab research has suggested the tactic could be useful against RA, said Dr. Kevin Tracey, one of the researchers on the new study. Rheumatoid arthritis arises when the immune system mistakenly attacks and inflames the lining of joints throughout the body, leading to pain, swelling and stiffness. 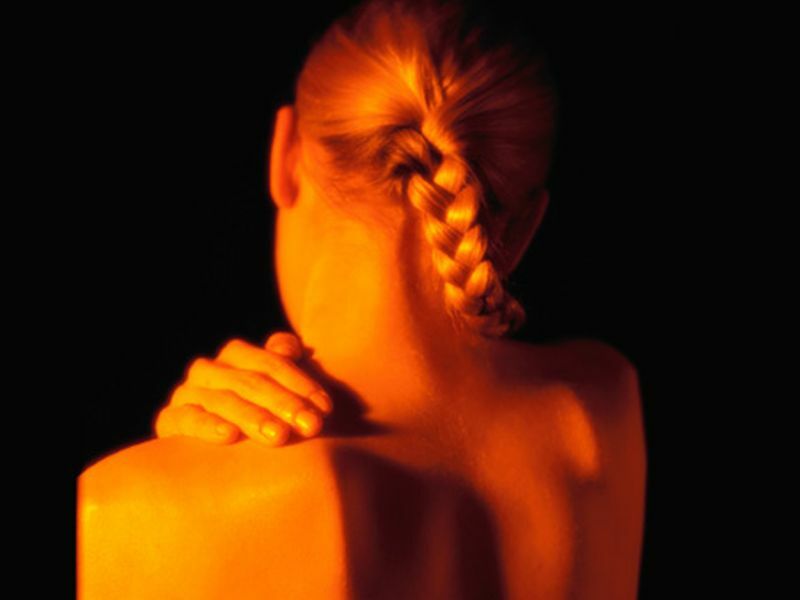 Over time, that inflammation can cause irreversible damage to the joints. The vagus nerves pass through the neck and chest into the abdomen, affecting many different processes in the body. It turns out, Tracey explained, that select fibers that branch off the nerves play a key role in inflammation. Animal research has shown that stimulating the vagus nerve can lower levels of inflammatory chemicals produced by the immune system, including tumor necrosis factor (TNF) and interleukin-6. Basically, Tracey explained, the nerve acts as a "natural protective mechanism" against those inflammatory chemicals. In that way, it works similarly to many of the standard drugs used for RA, said Tracey, who is president of the Feinstein Institute for Medical Research, in Manhasset, N.Y.
Those RA medications, known as "biologics," include drugs like Enbrel (etanercept), Humira (adalimumab) and Remicade (infliximab). For some people, Tracey said, the drugs work "miraculously." "But for many patients, they are not enough," he added. "And some people would prefer an alternative to those drugs, which are expensive and have side effects." For its study, Tracey's team implanted a VNS device in 17 patients with rheumatoid arthritis. Seven were in the earlier stages of the disease, and had not responded to a standard anti-inflammatory drug called methotrexate. The rest had more advanced disease and had failed to improve after trying at least two biologic drugs. Six weeks after the VNS devices were implanted, most of the patients were doing better, the study found. About 70 percent had at least a 20 percent improvement in their symptoms -- including a reduction in the number of tender, swollen joints. In the group with early stage rheumatoid arthritis, 57 percent had at least a 50 percent improvement; that was true for about 30 percent of patients with more advanced RA. On top of that, their blood levels of TNF and some other inflammatory chemicals declined. There was no "control group" to compare the patients against, Borenstein pointed out. But, he said, the symptom improvements were comparable to what's typically seen with biologic drugs. According to Tracey, there were no major side effects: Some patients developed hoarseness, which is a known issue with VNS devices. There are still plenty of questions left, though. It's not clear how long the benefits last, or what side effects there could be in the long run. Tracey said that because the therapy lowers TNF in the blood, in theory it could have the same side effects that biologic drugs do -- such as an increased risk of infections. "We won't know all of the side effects until we do larger trials," he said. But, Tracey added, VNS has been used for years for epilepsy and has proven "very safe" for those patients. Borenstein agreed that more studies are needed to see how vagus nerve stimulation might fit into RA treatment. He also questioned whether other methods of stimulating the vagus nerve -- including simple breathing techniques -- could be helpful. "Is there an approach that could be used as a complementary therapy, along with medication?" Borenstein said. SetPoint Medical, a company that is developing "neuromodulation" therapies for rheumatoid arthritis and other diseases, funded the study. Tracey is a consultant to the company, and several of his co-researchers are SetPoint employees.